Successfully Added Wi-Fi Signal and Camera Lens Detector to your Shopping Cart. Always stay one step ahead. Detect and find camera lenses and Bug devices in your surroundings with this camera detector. This bug detector works by detecting wireless frequencies that are emitted from wireless hidden devices and narrows in on its fixed position. This camera detector gadget works by detecting wireless frequencies that are within the range of 1 - 6500MHz. Once you switch this Detector ON, make a floor sweep of your environment and watch the LED's carefully, once the camera detector begin to pick up a wireless signal, the 4 LED's will then start to light up individually, and as you get closer to the signal all the LED's will begin light up in a row. This camera detector can also help you find hidden wired cameras by looking through the circular glass, while the 4 flashing LED lights reflect off the camera lens in order for you to locate its hidden position. Camera Detectors are very much in need in our society, with praying eyes all over the place along with private investigators, undercover journalists etc, all wanting to be the next James Bond. 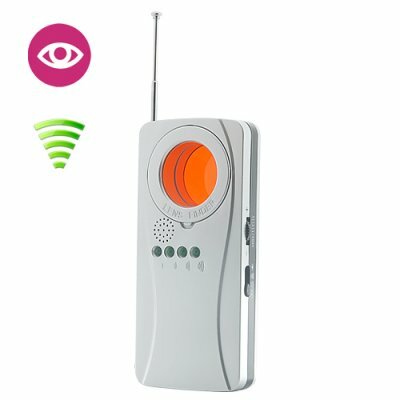 This Camera Detector will detect and find hidden cameras be they wireless cameras or wired cameras by using both Flashing LED's and a wireless signal detector with LED signal strength indicators. This amazing camera detector also comes in a compact form factor which makes it easy and comfortable to be taken everywhere with you, such as hotels, motels or even to a friends house. The CVMV-J19 is in stock now, get a sample today and see for yourself the wonders of counter surveillance. This camera lens and WiFi signal detector is proudly brought to you by the leaders in both and counter surveillance products, Chinavasion. What are the four LED indicators for? The 4 LED indicators light up in sequence as you get closer to the wifi signal. Very cool.